The tour was well run and very informative, but there just wasn't enough time to see each location. I wouldn't even mention The Cotswolds in this tour since we basically rode down a street and was told to look at the thatched roof homes. Even though our tour guide had a heavy Spanish accent we were able to get the main ideas of what he was telling us. He did good job keeping us on schedule. I just missed not being able to spend more time in Stratford and not being able to go inside the Bodliean Library in Oxford. Really nice tour , you have time to do your own things. Our guide was really polite and prepared a little bit repetitive with words, maybe he needs more experience. The tour is really all about the Guide as that is really what you are buying. My tour turned out to be a bi-lingual tour although it was not advertised as such, and our guide, Saul, gave his narrative in English and Spanish. I would have NOT signed up for this tour had I known it to be bi-lingual as it detracted from his narrative a great deal. And, his English was not that good so I cannot give it over two stars as it could have been better. Warwick Castle is for children and has been Disneyized. At Shakespeare's birthplace the rooms were described by children which made two parents pleased but I could not understand and would have preferred a professional description. The drive through the Cotswolds was lovely but how could it not be? Oxford was by far most interesting to me. We have been on this Tour before 15 or so years ago and then Warwick Castle was the highlight. No longer, as the safety regulators have applied 21st Century safety logic and humanism to make sure no one trips and/or is offended by references to torture QUERY: if no one mentions torture or cramped/inhumane conditions in the Dungeon, does that mean it never occurred?. Oxford, however, retains all its glory, as does Shakespeare's birth place. Perhaps an interesting tidbit -- you will earn the origin of the phrase sleep tight on this tour. Our guide was quite informative, especially about Oxford. This tour gives you exactly what it says - a chance to look around at 4 different locations outside London. Be aware that some of the stops are incredibly short and it leaves you wanting more time. 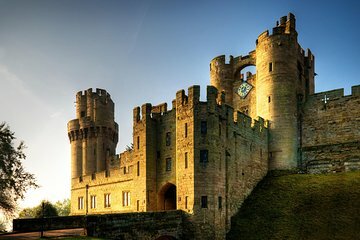 My advice to future travelers: don't include the lunch option with the tour, and buy yourself lunch at Warwick Castle instead. We are still 9 months later, ridiculing the lunch - it was a bottle of water and a 6 inch sub from Subway with lettuce and cucumbers - made enough in advance that the cheese had glued itself into the bread. My other thought - depending on your preferences, I would honestly skip Warwick Castle altogether and opt for a tour that spends more time at Stratford and Oxford - that's my preference, but do your research in advance, and see if Warwick Castle is where you want to spend a morning, as you have several hours there, and in some instances, 20 minutes at other locations. A great tour of the places I wanted to see and in my case come back to. Our guide Kingsley was very good, also in telling you all the extras you want to know i.e. where the expression its raining cats and dogs comes from etc. The schedule of the tour could by my standards be a little better distributed. I would have liked more time at The Cotswolds part which I feel we flew through more or less. An eloge to our driver Koly. Safe driving - we felt we were in good hands the whole trip and I also observed sitting close by how well he adapted his smooth driving to the traffic around us. Fantastic tour.... we were picked up at our hotel and whisked to the Victoria Coach Station. Everything was just great. Stratford upon Avon was more touresty than we would have liked, but seeing Shakespeare's birth place was awesome. The tour of Oxford was very informative. Warwick Castle was enchanting and very informative. All in all a very good adventure. Warwick was nice, we were given plenty of time there abit too much, if it was to compared with other places. Wished i could spend more time in Stratford and Oxford. Did not have time to even go into the buildings in Oxford this was our last stop before heading back to London. I would recommend doing it not as a tour to be able to have enough time in each place. Was denied lunch pack because I booked it too late, but they never advise prior to booking or even at the start of tour, if not I could have booked another tour that was slightly cheaper without lunch included，or even get my own food, so yeah i was very hungry while others were eating. My day trip to Stratford through the Cotswolds to Oxford and Warwick Castle a great day out packed with sites. The very informative and experienced guide gave an insight into the educational and personal life of the students and village of Oxford as will as the life and times of William Shakespeare and the aristocracy. I've been on trips where the guide is like reading from a script, a tourist themselves and you end up turning off not listening but when a local is sharing the love and passion they have for where they live it changes the experience for the tourist. My only complaint was the soggy lettuce roll that was lunch, picnic lunch saves time just make it edible.